The Old Print Shop and Robert Newman hosted the Print Club of New York for a private showing of their exhibition, WWI at 100 on April 6th, 2017. This is a show where war has been seen and remembered by artists. It features WWI posters, prints and drawings. Some of these were created as propaganda to motivate people to get behind the war effort. And some of the work was produced by artists during and after the war as memories of the action. Many artists did not begin to create these images until the 1930’s and at least one, Edward Hagedorn did it in response to the beginning of WWII. The Old Print Shop’s second floor focus will be on images of WWII and the Vietnam War. WWII was again imaged in prints by many artists, but the Vietnam War was almost totally documented with photography. Below image: Brothers! 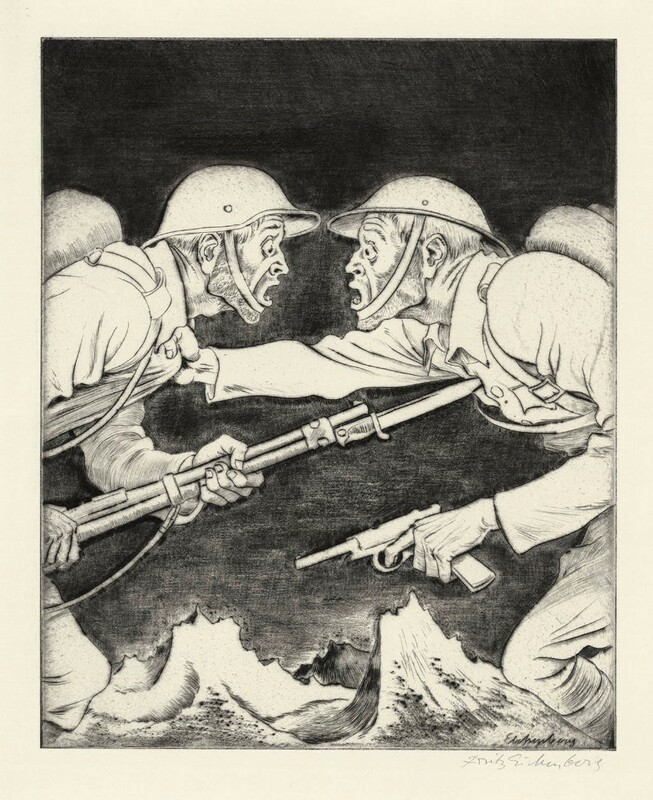 [Comrades in Arms] Drypoint and aquatint by Fritz Eichenberg, c.1934.